Environment: Occurs as a thin rim lining cavities and fractures in chalcocite-bornite ore. Locality: Old dumps near the La Rosario vein, Capillitas epithermal deposit, Catamarca Province, Argentina. Link to MinDat.org Location Data. 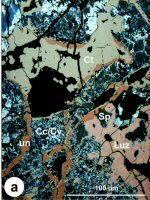 Comments: Polished section of putzite (pu) grain in close association with unnamed Cu8Fe2ZnGe2S12 (un1) and catamarcaite (ca), as inclusions in chalcocite-sphalerite (cc/sp) (CanMin 42:1761). Location: Old dumps near the Rosario vein, Capillitas mining district, Department of Andalgalá, Catamarca Province, Argentina.. Scale: See Image. Comments: Fractured aggregate of catamarcaite (Ct) composed of twinned grains with red internal reflections; Dg is digenite, Sp sphalerite. Oil immersion, crossed polars. (CanMin, v44:1481). RL Anisotrophism: Weak in shades of gray. RL Bireflectance: Very weak in oil, absent in air. RL Color: Grayish white with a distinct brownish tine with red internal reflections. note: Specific Gravity of Catamarcaite =4.93 gm/cc. U=PECatamarcaite x rElectron Density=1,236.49 barns/cc.